persons who have agreed to share the profits of a business carried on by all or any of them acting for all. Persons who have entered into partnership with one another are called individually, “partners” and collectively “a firm”. 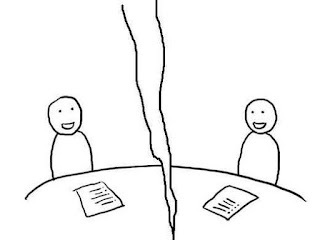 The word Dissolution implies “the undoing or breaking of a bond tie”. Dissolution of a firm amounts to a complete closure of the business and all the relations and the business of the firm comes to an end. On dissolution of the firm, the business of the firm ceases to exist since its affairs are would up by selling the assets and by paying the liabilities and discharging the claims of the partners. 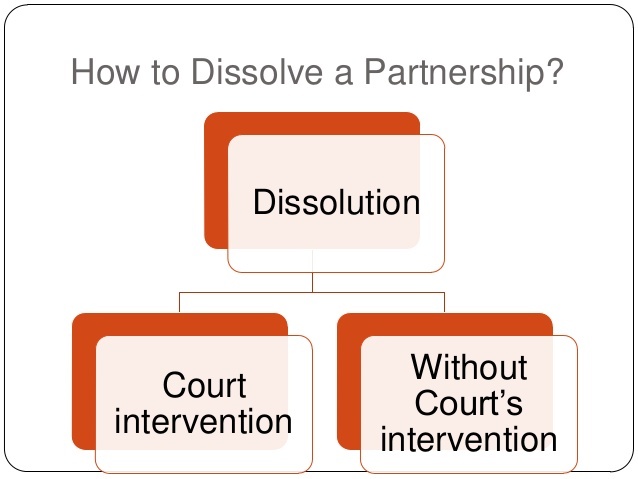 According to section 39 of the Indian Partnership Act, the dissolution of a partnership between all the partners of a firm is called the “dissolution of the firm". 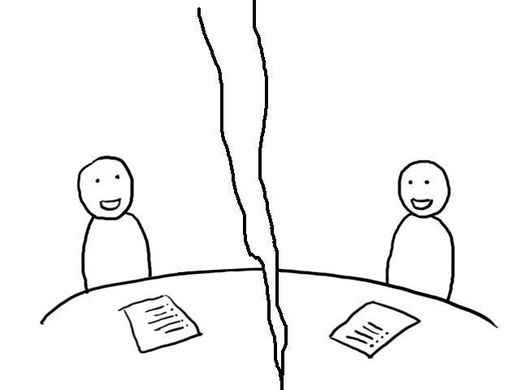 (b) As per the terms of partnership agreement. (b) Unlawful business - by the happening of any event which makes it unlawful for the business of the firm to be carried on or for the partners to carry it on in partnership. (c) Completion of specific task - Completion of the specific venture or project for which the firm was formed. 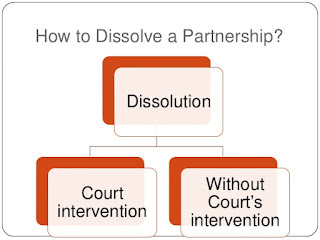 In case of partnership at will, the firm may be dissolved if any of the partners gives a notice in writing to the other partners signifying his intention of seeking dissolution of the firm. The notice must be clear and certain. The firm is dissolved as from the date mentioned in the notice as the date of dissolution or, if no date is so mentioned, as from the date of the communication of the notice. (a) A partner becomes insane. On the application of any of the partner, court may order for the dissolution of the firm if a partner has become of an unsound mind. (g) The court, on any ground, regards dissolution to be just and equitable.